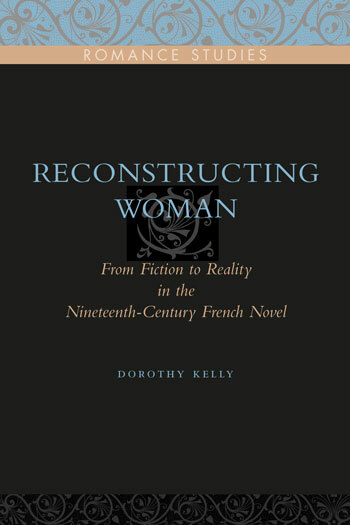 Reconstructing Woman explores a scenario common to the works of four major French novelists of the nineteenth century: Balzac, Flaubert, Zola, and Villiers. In the texts of each author, a “new Pygmalion” (as Balzac calls one of his characters) turns away from a real woman he has loved or desired and prefers instead his artificial re-creation of her. All four authors also portray the possibility that this simulacrum, which replaces the woman, could become real. The central chapters examine this plot and its meanings in multiple texts of each author (with the exception of the chapter on Villiers, in which only “L’Eve future” is considered). The premise is that this shared scenario stems from the discovery in the nineteenth century that humans are transformable. Because scientific innovations play a major part in this discovery, Dorothy Kelly reviews some of the contributing trends that attracted one or more of the authors: mesmerism, dissection, transformism, and evolution, new understandings of human reproduction, spontaneous generation, puericulture, the experimental method. These ideas and practices provided the novelists with a scientific context in which controlling, changing, and creating human bodies became imaginable. At the same time, these authors explore the ways in which not only bodies but also identity can be made. In close readings, Kelly shows how these narratives reveal that linguistic and coded social structures shape human identity. Furthermore, through the representation of the power of language to do that shaping, the authors envision that their own texts would perform that function. The symbol of the reconstruction of woman thus embodies the fantasy and desire that their novels could create or transform both reality and their readers in quite literal ways. Through literary analyses, we can deduce from the texts just why this artificial creation is a woman.